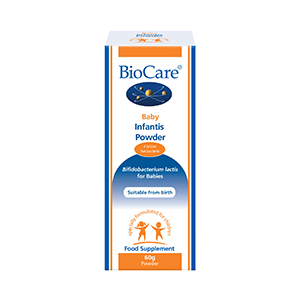 Baby Infantis powder contains Bifidobacteria which is a bacteria found in breast milk and is suitable for children of all ages but most appropriate to infants prior to weaning. A 1/4 teaspoon/1 gram contains four billion live bacteria. Suitable for breast-fed and formula-fed babies. One quarter teaspoon (approximately one gram) daily mixed into a small amount of sterile water or suitable milk to form a paste. Give orally alongside baby's feed. During weaning, Infantis Powder can be mixed into cool or warm soft food. Suitable from birth and up to around one year of age. If you are under medical supervision, please consult a doctor before use This product should not be used as a substitute for a varied and balanced diet and healthy lifestyle. Do not exceed the stated recommended daily intake. Keep out of reach of children. • Refrigerate below 4oC and avoid direct sunlight and heat.